We are still winging our way through Scandinavia and this time we've touched down in Copenhagen, Denmark. Kind of reminds me a lot of Stockholm but with a slightly edgier grunge to it. The city is becoming known as a new hotbed of creative cuisine as they already have 2 of the top 50 restaurants in the world here Noma and Relae. Those I'll talk about in another post. Seems you turn any corner here and your run into some sort of cafe. Folks here seemingly worship the sun and take every opportunity to bask in it. I don't know how they do it as the rays feel a bit relenting as I run from shade to shade. This is a big walking and biking town and me and the SO have been going all over. Our goal today was to hit up this funky spot over on what they call the Paper Island, as the space used to be an old paper mill. 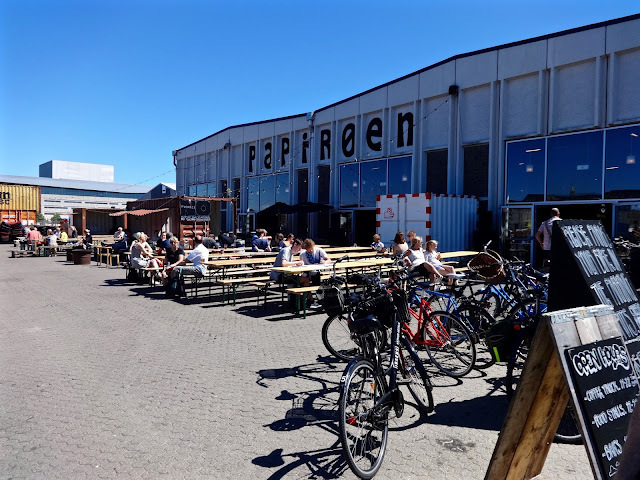 Now it's been turned into Copenhagen Street Food--a giant warehouse space with food stalls and a few trucks inside and tons of waterfront tables to nosh and enjoy more of that sun (fortunately for us there are some inside spots too). We arrive at the place around noonish and though it supposedly opened at 11am it still seems to be getting started on the lunch crowd. Several stalls are not even up and running yet which was a shame as one spot was serving up a Monster Surf & Turf Burger with beef, shrimp, scallops, whisky onions and sweet potato fries on a bun. Yeah, I would have been all over that but even after the one hour time frame the dude said he be ready by, he still wasn't and it as time for me to just move on. Our first stop seemed to be a popular one as I have to say folks here really like their burgers and pizza. 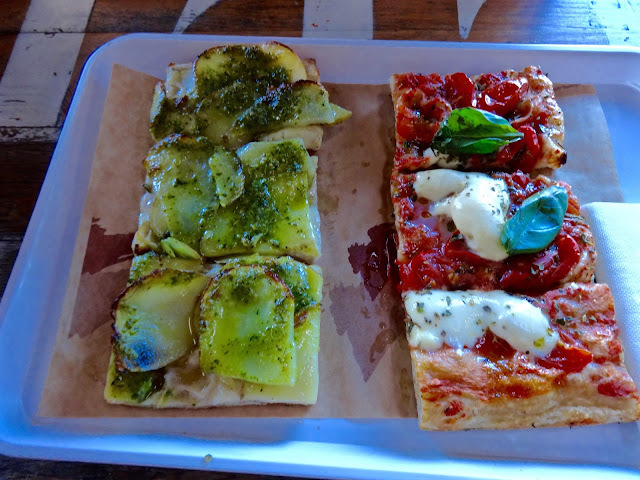 We hit up Slice of Rome which was serving up semi-thin crust square with a variety of toppings to choose from. I let the SO pick the ones to try since I'd dragged us all the way over here. Pesto potato and caprese with mozzarella, tomatoes and basil. The SO really like both of these and thought the potato was the best. My, I was slightly underwhelmed by both. The potatoes were a little too under done for my taste and the other was a tad too sweet with not enough cheese to go around. I did however, really like the crust on these. It was almost thin with a slight rise to the dough and somehow they have managed to keep the bottom of the crust nicely crisp and crunchy without that burned char taste that sometimes happens. It was more thin focaccia with a butter taste than a standard semolina dough type thin crust. I think I would have just been happy with the crust and some melted cheese on top. Still SO yes, me sort of. Plus, many folks were gobbling up them up. I decided to go a little local and picked another place that had a fair amount folks in line too called Copper and Wheat. 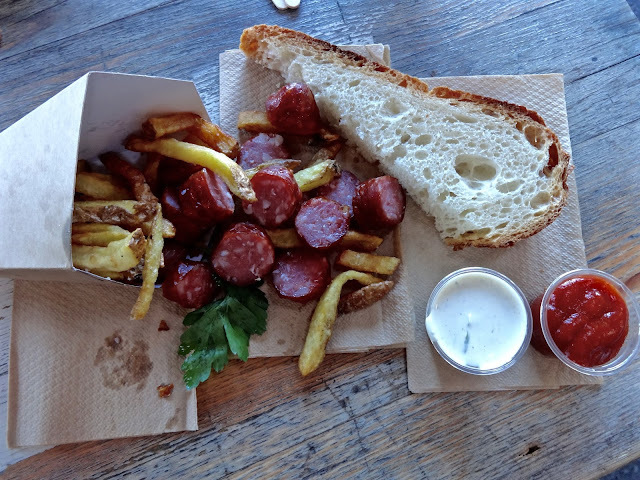 It's run by two guys from France doing up local specialties along with Belgium duck fat fries--the one item that EVERYONE was getting. I settled on the snack of the day to try. Danish style cured beef sausage with bread and double duck fat fried french fries. I'm not sure what made the sausage Danish and it was also supposed to be the spicy version but I certainly couldn't taste any. Otherwise it was a nice cured beef, not too fatty or dry, but then again, not too much flavor going on in it. I think it might have been better slapped on a bun with some sauerkraut and mustard or something. I got some of their home made garlic chive dipping sauce with helped, though that too lacked as much garlic as it should have had. As for the fries, they were good, but I'm not sure what the duck fat was doing for them. I honestly couldn't taste any difference between them and regular fries. I got a hot bunch as they came straight from the fryer to a bowl to be lightly salted (could have used some more) then into the box. Hot and mostly crispy, but not, wow duck fries! kind of flavor I was expecting. Probably should have gotten a Carlsberg to go with it then I might have enjoyed it more, oh well. To finish off my experience here I went to Polse Kompagniet, an organic hot dog and sausage truck doing variations of Scandinavian flavors. Hot dogs also seem to run neck and neck with burgers as a local food favorite. 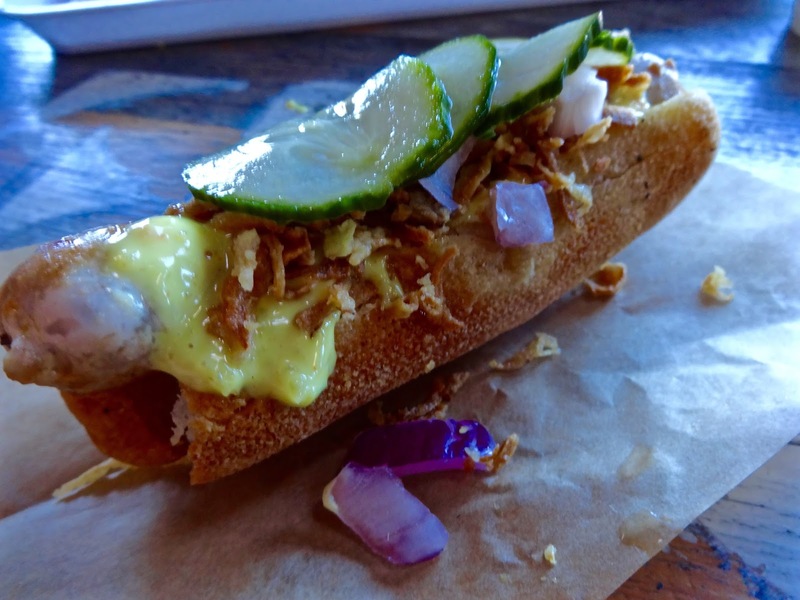 I went all in with the Danish Classic--a salt and pepper sausage with pork, pickled cucumbers, ketchup, mustard, remoulade, raw and fried onions on a toasted French roll--for 40DK, that's roughly $7. What you get is a small handful that is equal to about 4 bites. The ingredients sound a little odd but I think they mixed together quite nicely. You have some crunch, some sweet, some tang, crisp cucumber, a little spice all in one compact package. I think the only thing that sort of missed for me was the sausage itself. I could taste notes of pork but not much else and the toppings sort of ran rough shod over any flavor the meat may have given off. Still, I liked what I got and maybe a beef hot dog could have held up better against the toppings onslaught but for the price and the local flavors, it was still worth trying. I was hoping this place would have a dessert cart or two, but they only had one and they were serving up different cheesecakes. Oddly, on this particular afternoon, I was really in the mood for cheesecake. It seemed a little too heavy after all the other things we'd had. I wanted like a cookie or light donut thing but, alas, it was not to be here. I guess if you are ever in Copenhagen, I'd totally recommend making your way over to Street Food to check out the scene. It's a funky, fun day out and you could spend a few hours just hanging out eating and drinking by the water while taking in the panoramic vistas of the city across the canal. One thing to note, the place is right next to something called the Experimentarium, it's a lot like the Exploriatorium in San Francisco, a highly charged kids museum warehouse of interactive thingys. Thus, there are many kids running around, though not many make their way over to the food side and the ones that do come with parents and are mostly more behaved kids than you'd find in the US. If you do go, it's best to bike over and take a big hat and some sunscreen if you want to sit outside as they have zero shade. But the food and drink options are plenty and they are open till 10pm, which means you'd still have another hour to get home before the sun even sets! Yeah, still weird, I know, but that's Scandinavia for ya, so sit back and enjoy.